How about playing for over 14 hours? And in one single rally, too. No kidding. This was exactly what two identical twin brothers in the US did in 2008. 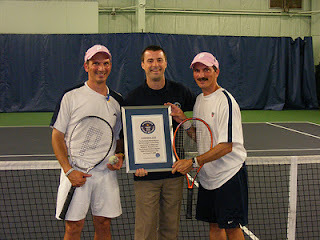 In last year’s Wimbledon, we had the longest tennis match ever, which was an 11-hour-and-five minute epic which spanned over three days (see my entries on 24 and 25 June 2010). What Ettore and Angelo A. Rossetti performed was an equally jaw-dropping feat. 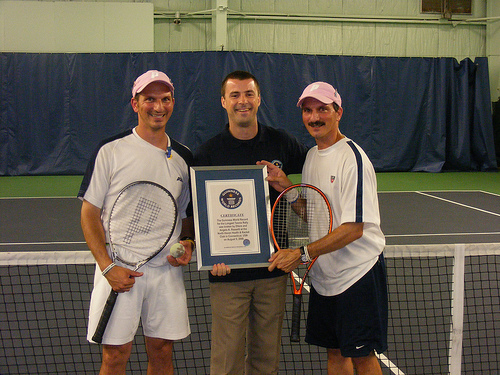 On 9-10 August 2008, they broke the official Guinness World Record for the Longest Tennis Rally by playing a 25,944-stroke rally which took over 14 hours and 31 minutes. This was certified by video, eye witnesses and a Guinness World Record official adjudicator. The event was for charity and a five thousand US dollars were raised.